On the principles of isosterism and for the new antiplatelet aggregating drug purposes, nineteen N,N’-di(3-substitutedphenyl)-4-methoxylbenzene-1,3-disulfonamides of series 2 were synthesized by two steps of reactions including chlorosulfonation and ammonolysis. There in vitro anti-platelet aggregation activities were evaluated by Born test and in comparison with their structure analogues of 4-methoxyisophthalamides of series 1. Results among the series 2 screened, compound 4n has the highest activity and 7 compounds (4b, 4d, 4g, 4h, 4j, 4n and 3h) have higher activities than that of the control drugs both Picotamide and Aspirin. Platelet aggregation is one of the most significant factors in the development of thrombotic disorders, which plays a central role in thrombosis (clot formation) [1-3]. Picotamide (Figure 1), also known as N,N’-bis(3-pycolyl)-4-methoxylisophthalamide, is an antiplatelet drug with a dual inhibitory action, which inhibits both thromboxane A (TXA2 ) receptors and TXA2 synthase and at variance with aspirin, does not interfere by endothelial prostacylin (PGI2) production . On the purpose of searching for novel antiplatelet aggregating drugs, since 2000,we have carried out the antiplatelet aggregating activity studies of various series of isophthalamides of series 1 (Figure 1), which are the structural analogues of Picotamide and was synthesized via replacing the two 3-pycolyl groups in picotamide with two substituted phenyl groups attached to the nitrogen atoms. And in which some compounds exhibited higher antiplatelet aggregation activities than picotamide . After 2005, in continuation of our interest on the synthesis of related compounds N,N’-disubstitutedphenyl-4-methoxyl-benzene-1,3-disulfonamidesseries of series 2 (Figure 1) [6-8], it is based on that benzene-1,3-disulfonamide is the isostere of isophthalamide. In order to further study the structure-activity relationship (SAR) of the benzene-1,3-disulfonamides in antiplatelet aggregation, especially the influence of different meta-position substitutedphenyl groups on anti-platelet aggregation activities, 18 N,N’-di(3-substitutedphenyl)-4-methoxybenzene-1,3-disulfonamides were synthesized and their in vitro anti-platelet aggregation activities were screened induced by adenosine diphosphate (ADP) using the Born’s method in this article. Besides, comparison of the in vitro anti-platelet aggregation activities of the same substitutions attached to the same positions of the two side chain benzene rings between series 1 and series 2, respectively. The chemical structures of these target compounds were confirmed by IR, 1H-NMR and M (Figure 1). Figure 1. Structures of Picotamide (1), Isophthalamides (2) and Benzene-1,3-disulfonamides (3). According to the antiplatelet mechanism and based on the principles of bioisosterism, a sulfonyl group is an isostere of carbonyl group and the sulfonamide is a bioisostere of the amide. And in order to realize the directive influence of different ring substituents on antiplatelet aggregation activity, each target compounds of series 2 were designed. Firstly, the 4-methoxy group of series 1 was still maintained in the same 4-position of series 2. Secondly, each of series 2 are containing two sulfonyl groups in two side chains of benzene ring replacing the corresponding two carbonyl groups of series 1. Thirdly, with two meta-position monosubstituted phenyl groups including hydrogen and other twelve substituents [F,Cl,Br, I,CH3,CH(CH3)2,COCH3,NO)2,OCH3,OCH)2CH3,OCH2COOH,OCF3] replacing the two phenyl groups of series 1, respectively. Thirteen N,N’-di(3-monosubstitutedphenyl)-4-methoxybenzene-1,3-disulfonamides (2a-2m) were designed, which provide an opportunity to research the influences of the steric factor, such as alkyls [CH3, CH(CH3)2] and alkoxyl [OCH3, OCH2CH3] substituted compounds named 2f, 2g and 2j, 2k; and electronic factor such as nitro group (one of the most powerful electron-withdrawing ) as well as halides (F, Cl or Br) on antiplatelet aggregation activities of different positions of two side phenyl rings. Fourthly, attaching another one halide (F, Cl or Br) to 4-position of the monohalide phenyl groups, five N,N’-di(3,4-disubstitutedphenyl)-4-methoxybenzene-1,3- disulfonamides (2n-2r) of series 2 were designed in order to study the influence of another halide on the activity. We designed the same routes for the synthesis of the target compounds 2a-2r as follow as reported in (scheme 1) . The route we choose depends on such factors as convenience, expense, and expected yield of the target molecules. Reaction of anisole 4 with chlorosulfonic acid to produce 4-methoxybenzene-1,3-disulfonyl chloride 5, then react easily with the mono-substituted-anilines at room temperature in tetrahydrofuran and triethylamine to produce the desired sulfonamide products 2a-2m in good yield. While 5 react with the dihalidesubstituted-anilines in tetrahydrofuran and triethylamine to produce the sulfonamides 2n-2r. The two reactions of b and c in Scheme 1 are carried out in the presence of some base that serves to neutralize the HX formed in the reactions and the yield of the crude sulfonamides is almost over 90% (Scheme 1). Scheme 1. Synthetic routes of target compounds. Reagents and conditions: (a) ClSO2OH, SOCl2, CH2Cl2, NaCl, DMF, 40°C, 60°C, 9h; (b) ArNH2, Pyridine, EAC, r.t, 24h; (c) ArNH2, Pyridine, EAC, 60°C, 6h. Melting points were determined with Kofler micro melting point apparatus without corrected; IR spectra were recorded on FT-IR 1700 infrared spectrophotometer and expressed in cm-1; 1H-NMR spectra were recorded on a Bruker-400MHz spectrometer dissolved in solvents (DMSO/CDCl3/CD3COCD3) with TMS as the internal standard (chemical shift was measured in δ ppm); Mass spectra were measured on Xevo GZQ-Tof VHRS mass spectrometer. The synthesis of the target compounds were obtained by (Scheme 1) . Compounds 2a-2m was gained following the described typical procedure. The solution of 4-methoxylisophthaloyl dichloride (0.93 g, 4.0 mmol) within anhydrous tetrahydrofuran (15.0 ml) were added the pyridine (1.0 ml) and 3-acetylaniline (1.08 g, 8.0 mmol). After the mixture reaction at room temperature for 24 h under a rapidly continuous stirring, then refluxed the solution for 4-8 h (monitored by TLC). The solution was concentrated in vacuo and the residues were recrystallized from methanol-water to give compound 2h (60.0%), MP: 225-227°C. In the same way, compounds 2a-2g and 2i-2m could also achieved while compounds 2n-2r were prepared at room temperature for 1H, then refluxed at 60°C for 6 h (monitored by TLC). (Table 1) lists the physical properties and spectral data of the target compounds of series 2. D=platelet aggregate in the presence of test compounds; S=platelet aggregation in the presence of solvent. 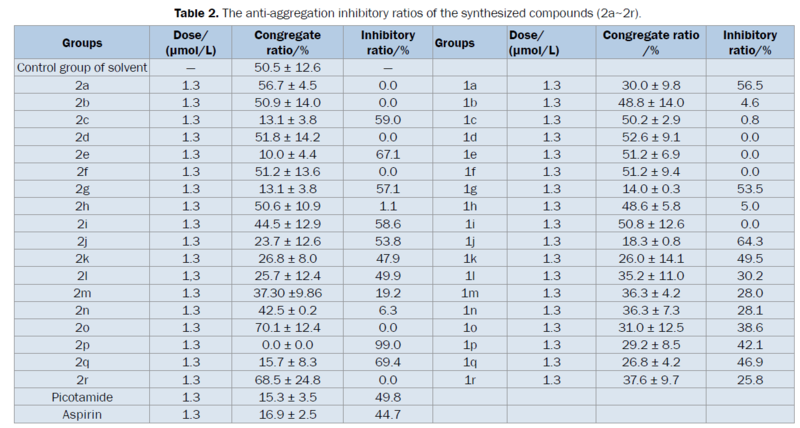 The antiaggregation inhibitory ratios of compounds (2a~2r) were listed in (Table 2). Table 2. The anti-aggregation inhibitory ratios of the synthesized compounds (2a~2r). Based on the principles of isosterism, nineteen N,N’-di (3-substitutedphenyl)-4-methoxylbenzene-1,3-disulfonamides of series 2 were synthetized. And there in vitro anti-platelet aggregation activities were evaluated by born test and in comparison with their structure analogues of 4-methoxyisophthalamides of series 1.The chemical structures of each target compounds of series 2 were characterized by IR, 1H-NMR and MS. The results screened indicated that among the series 2, compound 2p has the highest activity, and other 7 compounds (2c, 2e, 2g, 2i, 2j, 2l and 2q) have higher activities than two control drugs Picotamide and Aspirin. In the compounds with two meta-position monosubstituted phenyl groups, nine compounds 2c (3-Cl), 2e (3-I), 2g (3-CH(CH3)2), 2i (3-NO2), 2j (3-OCH3) and 2l (3-OCH2COOH) of series 2 and 1g, 1j and 1k (3-OCH2CH3) of series 1 showed better activities than both Picotamide and Aspirin. By the contrast, the influence of 3,4-dihalide groups on the activities between series 2 and series 1, 2p (3-F, 4-Br), 2q (3-Cl, 4-F) of aryl sulfonamides of series 2 showed higher activities than Picotamide and Asprin. Mirfazli SS, et al. N-Substituted indole carbohydrazide derivatives: synthesis and evaluation of their antiplatelet aggregation activity.DARU Journal of Pharmaceutical Sciences. 2014;22:1-10. Zhang M and Sheng HL. Antiplatelet Trialist’s Collaboration. Collaborative overview of randomized trials of antiplatelet therapy. Prevention of death, myocardial infarction, and stroke by prolonged antiplatelet therapy in various categories of patients. BMJ 1994;308:81-106. Celestini A and Violi F. A review of picotamide in the reduction of cardiovascular events in diabetic patients. Vasc. Health Risk Manage2007;3:93-98. Canonico V, et al.Valutazioneclinico-strumentale della efficacia deaal picotamide nel trattamento delle arteriopatie croniche strutive degliarti inferioriMin. Cardioangiol. 1991;39:75-80. Wang S, et al. Design and synthesis of new arysulfonamide and arylamide derivatives for the platelet aggression inhibitor. Chin Chem Lett2003;6:518-584. Liu X, et al. Synthesis and platelet aggregation inhibitory activities of the analogues of picotamide. Chin J Med Chem 2005;15:332-335. LiuX, et al. Synthesis of picotamide analogues and their platelet aggregation inhibitory activities. Chin J Med Chem 2007;17:, 354-357. Liu X, et al. Bioorganic and Medicinal Chemistry Letters2012;6591-6595. Liu X, et al. Synthesis and in vitro activities on anti-platelet aggregation of N, N'-di (2-substituted-phenyl)-4-methoxy isophthalamide and benzene-1,3-disulfonamides. Chin Chem Lett 2011;22:1139-1142. Violi F, et al. Inhibition by picotamide of thromboxane production in vitro and ex vivo. Eur J Clin Pharmacol1988;33:599-601. Li J, et al. The mechanism of apoptosis in human platelets during storage. Transfusion 2000;40:1320-1329.